Product use:The building wire mesh welding machine can be used for 1.floor pouring and building laying net.2.welded wire mesh,geothermal mesh,seedbed net,flower room net. 1.Using PLC programming control system,you can adjust the width of the mesh through the touch panel of the electric cabinet. 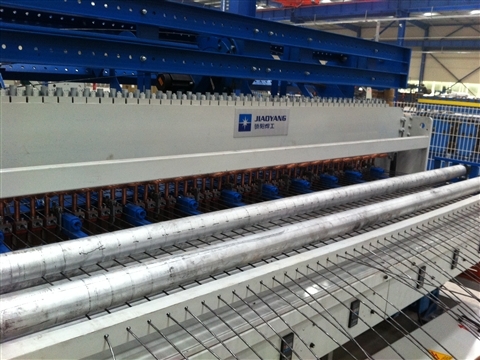 2.The horizontal wire feeding adopts the stepping motor to control the automatic blanking and the blanking is accurate. 3.The longitudinal wire adopts circulating drawing and feeding,which has reasonable structure and simple control. 4.The pulling mesh adopts servo motor pull mesh control,and is equipped with automatic net cutting device.It can complete the welding of the mesh without cutting,which greatly improves the work efficiency and saves the labor cost. 5.The welded stud and copper block are made of high-copper copper,which has a long service life and no need to replace the stud frequently. 1.The warranty period of the whole machine is 12 months,and the equipment program is partially maintained for life.The warranty does not include vulnerable parts(welding electrodes and joints, etc. )and man-made damage. 2.The customer equipment is faulty.Our company gives a clear reply within 24 hours after receiving the user's call,and goes to the customer company for maintenance before the time. 3.After the warranty period,our company provides lifetime after-sales service support,and provides equipment accessories at the original price of accessories.